Hey guys. Hope someone can assist a newbie to messing around with guns. 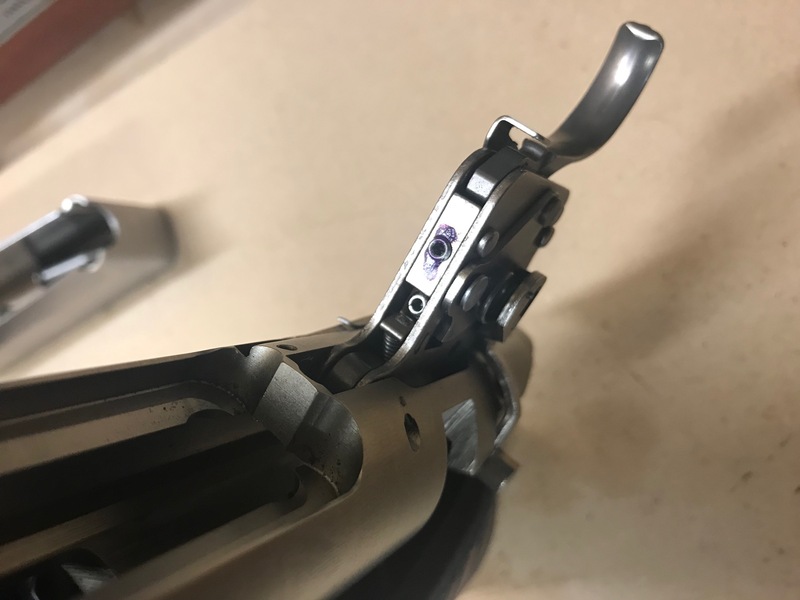 So I’m wanting to lighten the factory trigger on my model 700 SPS. Before you say “buy a Timney or XYZ trigger blah blah blah”, these are supposed to be about as good as factory triggers get, and well, I can’t afford to. I followed the instructions on a couple of YouTube clips and adjusted the first two grub screws okay, but the third refused to budge. The Allen key ends on slipping and has now been rounded off now by the screw. I’ve spent ages making sure there is no loctite around it. I think the problem is that the screw has split, meaning it opens up whenever I apply torque to the key. 1. Has anyone else experience this problem, i.e. am I right with my diagnosis? 2. If so, how would I go about getting the screw out? I assume I’d need some sort of screw removal tool. 4. Is there anyone in Chch / North Canty with the gear, time & inclination to give me a hand? 5. Any other bright ideas? Smartass suggestions also welcome for humour’s sake. Thanks. Would post a pic if I could figure out how from my phone. Okay, here's a pic. The grub screw in question is the top front one (lower left of the two in the pic). Hopefully you can see the little crack that leads me to believe it has split. kiwijames, Steve123, dannyb and 1 others like this. dannyb and mopheadrob like this. The factory M700 triggers have the adjustment screws locked with a very strong grade of Loctite. This bond can only be broken with heat. A fine point electric soldering iron on the screw will do the trick without heating the whole assembly and buggering the springs. If you try to move the screws without breaking the bond then you get the problems you have experienced. Hutch, dannyb and mopheadrob like this. Thanks @gundoc, that will explain it. Will give it a go with a soldering iron, and follow @gone-tropo 's advice if that doesn't work!!! Sage advice @Bill999. I believe that if I own something, I should know how to service / fix it. There are limits, though! I did try Gunworks, but they have a policy of not working on triggers that someone else has fiddled with. Put an after market trigger in it!! If not, and you screw the one you have, Ill sell you another of those "best quality" Remington triggers I have preserved in a box and ready to go for such an occasion!! True but the highlighted part of your quote does not necessarily mean you will have a good outcome even if you don't mess with it first. A fine point electric soldering iron on the screw will do the trick without heating the whole assembly and buggering the springs. If you try to move the screws without breaking the bond then you get the problems you have experienced. Update - tried the soldering iron @gundoc but no joy, so I took @gone-tropo 's advice and went to see Zach Earl. Zach informed me that the glue needs a blowtorch, but I didn't need to touch that screw anyhow. I felt better about myself after it took him a fair bit of buggering around with the pull weight and sear engagement screws before he got it to an acceptable 3lb. Not super-light, but nice & crisp. Apparently the older M700 triggers before the x-mark were more adjustable... any of yours that type and going for next to nothing @Maca49? Happy with the feel of my rifle now and a having much better understanding of its inner workings. Just need to find myself a four-legged target to test it on! Thanks for the advice you guys, and a big thumbs-up for North Canterbury Gunsmithing Ltd.
As Zach was my apprentice then I am not surprised! I always used a needle flame with oxy acetylene which keeps the heat localized. The soldering iron trick is for people with no gas, or using a propane torch which heats the surrounding area too much. csmiffy and mopheadrob like this.